It’s still summer. Despite all the Halloween decorations and candies in the stores, it is still summer and I want to enjoy more summertime things. Traditionally we like to get funnel cake every time we go to the beach, but the last time my daughter insisted on ice cream instead. While we were in line I saw so many types of funnel cake there: lemon meringue, strawberry shortcake, even a boozy funnel cake that I can’t quite remember. Last year I made regular funnel cakes that I topped with lemon white chocolate that was better than anything I’ve ever had on the boardwalk. I decided to modify that recipe to make a chocolate funnel cake. My idea was to make something inspired by Black Forest cake. 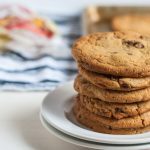 Traditional Black Forest cake is my favorite, but I do love that combination of chocolate, cherries, and cream and knew it would make an amazing boardwalk treat. I had the idea to make the chocolate funnel cakes for a while now, but I’d been dreading the mess I’d make transferring the batter to the funnel from my mixing bowl. Last time I made funnel cakes I got batter everywhere. Even the ceiling. I have no idea how I did that happened. But during a trip to Aldi I found this amazing little contraption that I could pour all my batter in and pour out like a watering can. It’s the best. I freaked out when I found it. I know I probably sound so lame right now, but I don’t care. It’s going in my “Take to Seattle” pile. How can you describe something that is so utterly amazing? 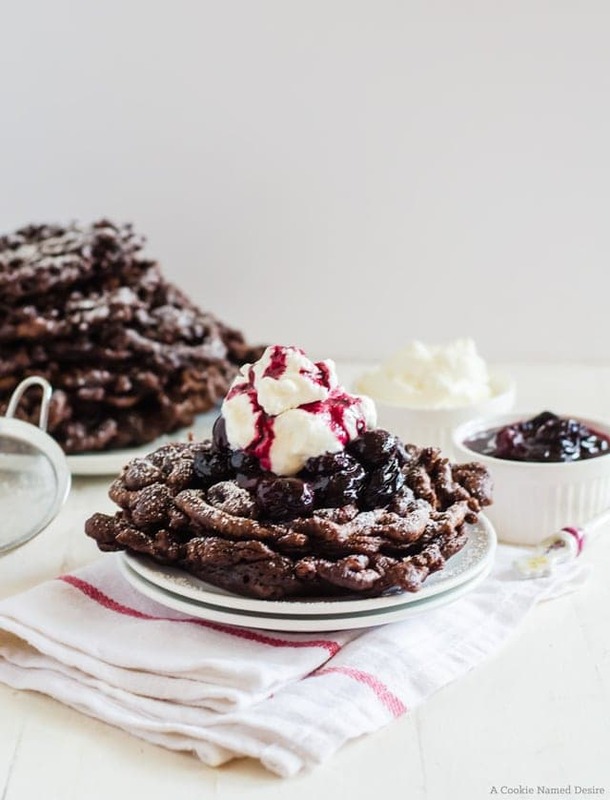 The chocolate funnel cake on its own is sweet, but certainly not overbearingly so. You can generously sprinkle powdered sugar and be happy with your life choices. 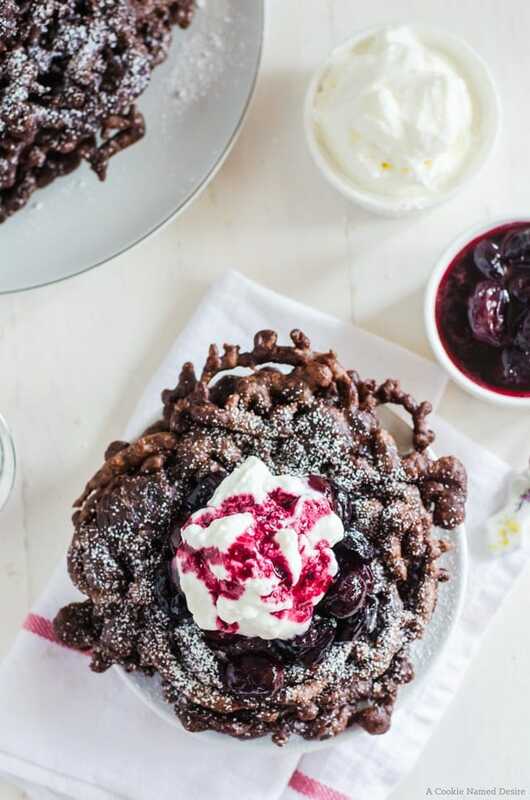 The addition of the cherry compote and whipped cream makes this funnel cake otherworldly. The combination of fried chocolate dough, sweet black cherries, and fresh whipped cream is almost too good. I definitely had two funnel cakes for lunch the day I made them and do not regret a thing! Beat the eggs and milk together until it becomes frothy. In a medium bowl, mix together the sugar, flour, cocoa powder, salt, and baking powder together. Mix the dry ingredients into the wet ingredients and mix until there are no lumps. In a large cast iron skillet (I used a 12 inch skillet) heat about 2 inches of canola or vegetable oil until it reached about 375 degrees. It’s okay if it’s a little under. Pour your batter either into a funnel or piping bag with a round tip and swirl the batter into the oil in a mostly random circular motion. I like to kind of mimic the shape of a spider web. Cook the funnel cake on one side for a minute before flipping and cooking for another 45 seconds to a minute. 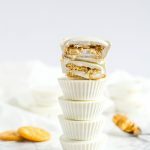 Place the funnel cakes on a wire rack covered in paper towels. 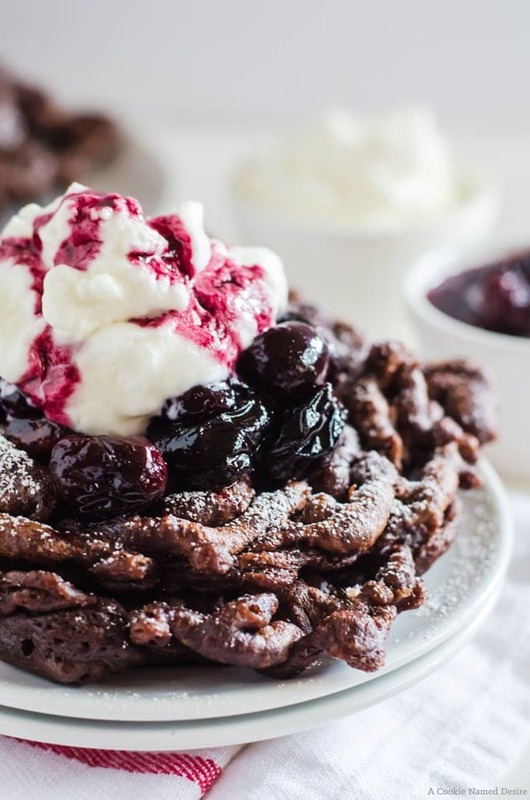 While you are cooking the funnel cakes, place the cherries and sugar into a medium saucepan and heat on medium-high heat until the juices release and form a syrup. Turn off the heat and stir in the vanilla. 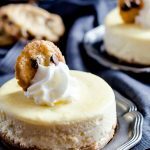 Use a chilled bowl and wire whisk to beat the heavy cream until soft peaks form. Beat in the powdered sugar. You may optionally reserve a tablespoon of powdered sugar to put over your funnel cakes. 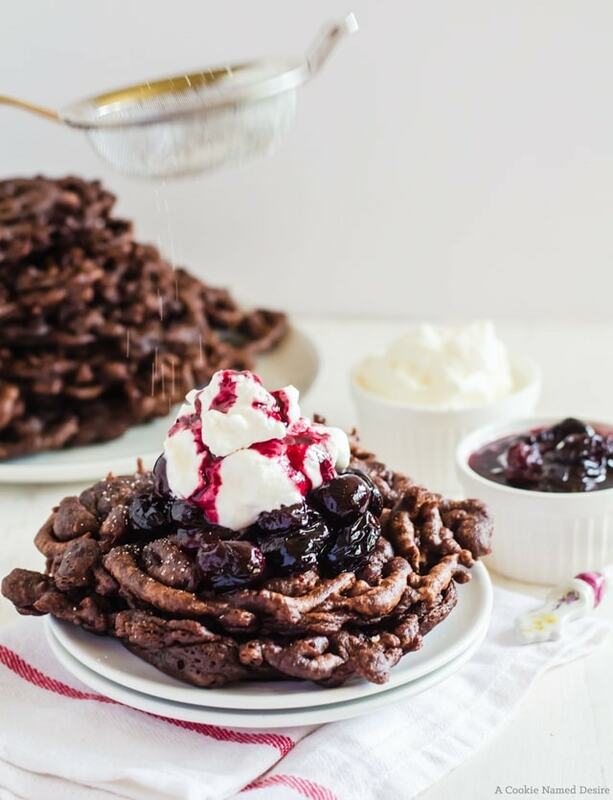 Top the funnel cakes with the cherries and then top with a generous dollop of heavy cream. Drizzle a bit of the cherry juice over the whipped cream if desired. Best if eaten immediately, but if you must wait, do not assemble until ready to serve. Funnel cakes are best served warm, but you may keep in an airtight container up to 24 hours. Oh wow! I love this; funnel cake is the best, but you really elevated it with this combination of flavors. Also, that batter watering can sounds great!!! I have…never made funnel cake at home. And now I am totally regretting that unfortunate life choice. These. Are. Glorious.